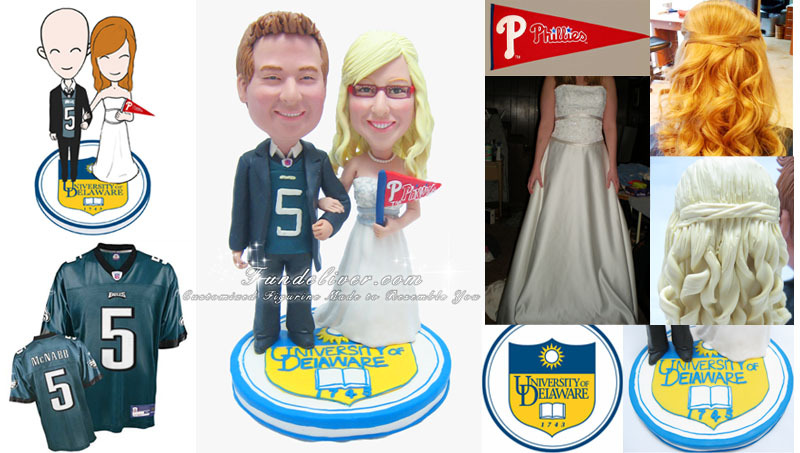 This is a completely customized UD theme wedding cake topper ordered by one of our customers. They want the McNabb Eagles Jersey to be on the Groom, under his tuxedo jacket, with the tux shirt collar coming over his jersey. Bride is holding the Phillies Pennant. Also they sent us a copy of the University of Delaware logo. They both went to school there and that is where they met. So they want to have that incorporated. So we designed a UD theme based for them. Perhaps you and your fiance/fiancee met in one of those university or college theme. 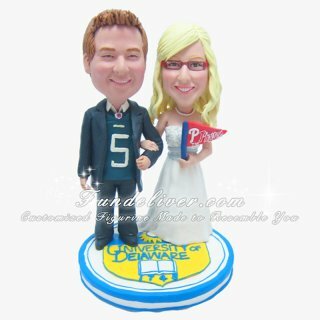 Why not have all your smiles put in your wedding cake toppers with your university or college logo? What could be more meaningful than a cake decoration that reminds everybody of the most important day of your life?